This is not just rare it doesn't exist. I am the only one with them. I purchased the prototype samples directly from the original importer They are top quality, designed in Germany, made in England. The pictures tells the whole story. Fits a wide variety of Kodak cameras. I know it fits all the Pony cameras that allow for a flash to be mounted on the side. The Signet 30 and 40, Brownies, etc. If the camera has a spot for a flash to be mounted on the side of it like the camera in the picture which is a Signet 30, then this will fit. You will need to use a flash that has a sync cord, attach it to the post on the adapter and fire away. Great idea, great design, great item, and neat accessory for your vintage camera. It is made of sturdy plastic with metal screws and metal sync terminals. 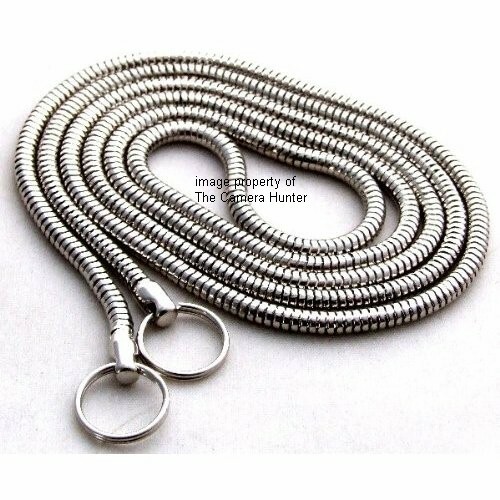 Here is a nice snake chain style strap to dress up your Camera. This is one of the better ones you will find. It is 3.2mm around and fully Nickel plated. These straps were popular in the hey days of the Leica, Nikon S & S2, Canon, Canonet GIII QL,. Zeiss Ikon Contax, Olympus, Konica, Kodak Retina, Asahi Pentax, Yashica, Petri, and Voigtlander Rangefinder cameras. I am not sure who exactly made them but they are made in Germany. This is top quality craftsmanship, made nice and strong. There is no manufacturers name. The rings will attach directly to your cameras strap lugs. The strap is brand new in the package. The total length is 33 3/4 inches. This is sure to provide you with a lifetime of faithful service. Carry your camera comfortably and securely with CLASS!